A tropical metropolis on top of this antipodes? Tony Abbott has a plan – to make the north of Australia more economically vibrant. Darwin has just 136,000 residents. It’s the smallest capital in Australia. Darwin certainly seems to be a lovely spot with room to grow. So why not? It doesn’t make sense that most of the population is in the southern half of the country, far from our populated neighbours in Asia. A highly developed north could be Australia’s California. California grew late in America’s development – in 1900 LA had 100,000 population while New York had 3.4 million. Comparable figures to Darwin and Melbourne today. But if expansion of population is the plan, we need to be clear why we’re doing it. Having more population made sense back when Australia feared being invaded. Populate or perish was the cry. These days our big risks are different. So the idea needs to stand up economically to make sense. Let’s have a look at what the economics of this tropical metropolis might be. 1. The Northern Territory would have a higher population, so the fixed costs of operating the jurisdiction – such as parliament – would be spread over more people. This is efficient. It would have a minor upside for the rest of Australia as smaller GST transfers would be necessary to the NT, and the remainder of the country would keep more. 2. With more people living in the tropical north, the area would have bigger markets, and greater economies of scale. Prices should drop for consumer goods, and the range of goods and services would increase. Good news for Darwinians tired of the same few pubs and restaurants! 3. Australia would get a higher GDP. This might give us more clout in global affairs, but wouldn’t mean much for most of us. It wouldn’t necessarily solve our unemployment problem. Per capita GDP is what matters – lifting the total output of Australia is irrelevant for most of us. 4. The NT is 30 per cent indigenous. By creating more employment opportunities in the north of Australia, development could help reduce indigenous disadvantage. 5. If successful, a booming northern frontier could reduce the population growth rates in the southern capitals. This might reduce the rise in house prices and diminish pressure to build expensive infrastructure through crowded areas. 6. A more happening north might attract more tourism. Darwin is already a big tourist town and with Australia on the brink of a tourism boom a bigger, better offering could help the whole nation attract more tourists. The risk would be actually diminishing its charm. The key is good urban planning so the inevitable ugly parts of development are invisible from the tourist hotspots. 1. Economic development always uses land. Changing the use of land always comes with an opportunity cost. In this case, the change would turn natural environment into suburbs and industrial parks. 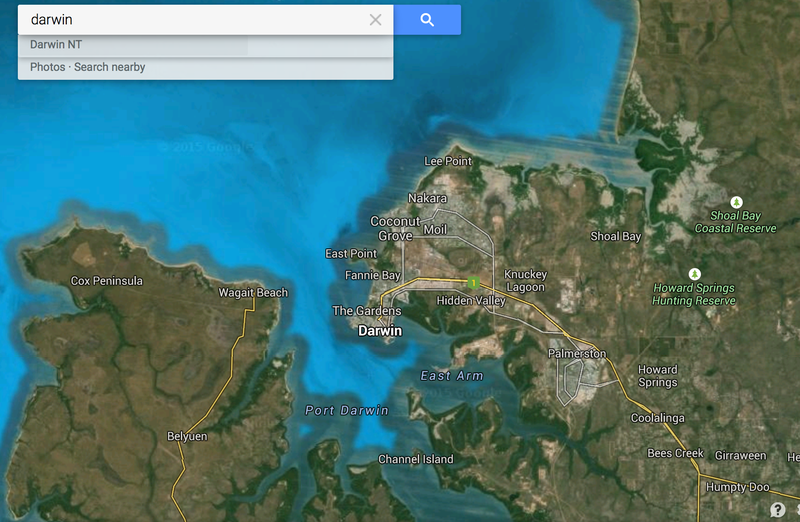 National parks are already close to the centre of Darwin. The location of development would need to be very carefully managed to make those opportunity costs worthwhile. 2. Putting another big city absolutely miles from the rest of Australia’s cities is only going to increase travel costs and times for the rest of us. Perth is bad enough! 3. Government effort could be expensive and futile. The plan to deregulate domestic routes in the north is already in tatters. Here’s the thing – forcing economic activity to happen in a certain place is next to impossible. Economic activity happens where it wants to. The venn diagram of development policies and failed development policies looks like a circle with only the faintest shadow. Having worked in both domestic regional development agencies and international aid efforts, I think I can say this with some confidence. We could be investing in a tropical white elephant. Is this plan more likely to create Australia’s California or Australia’s Alaska? Please share your views below! Well, unlike LA: Darwin has a plentiful source of fresh water. Because respiratory tract inflammation, caused by pollution and cold weather , is the leading cause of death in older people ( regardless of socio -economic circumstances ) you could make the case that more northern retirement living is better for the health of older people . Retired people live in Florida, Palm Springs , and Spain, near tennis clinics. Young people follow them to get jobs mowing the golf courses and running the retirement resorts. What follows is a slow transfer of wealth from the old to the young, in the form of retirement resort wages, or in the form of paying contractors to build the retirement resorts. Darwin is real long way north, and that means higher rates of skin cancer for all concerned. If it were me, I would be building retirement resorts in the warm inland areas between Caloundra and Gladstone, and maybe not even that far north. There is tons of unused land there, and highway development is already underway that would allow decent access to retirement resorts. I’ve worked in far north Qld in Bauxite exploration, and the ultra-violet and gamma radiation levels are more than capable of causing heat stroke and temporal lobe epilepsy. If you don’t want your cash cows- i.e your retirement resort residents to drop dead prematurely, I would suggest that you take into consideration the fact that the heat is more than capable of ruining your investment plans. There is a good reason why Great Keppel went bust. and the most northern city in California is Crescent City, Latitude 41 degrees, 45 minutes. And , Launceston, in Tasmania, at, 41.4332° S, is at about the same equivalent latitude as the most northern city in California, Crescent City. So having actually gone to the trouble of researching the latitude figures, I’ll correct my previous statement : If I were planning to construct a retirement resort or similar, I would do it a lot further from the equator than Qld. Maybe on the southern NSW coastal hinterland, and in fact it may well be a worth doing a proper assessment of Tasmania as a retirement location. The latitude figures above may well explain Australias skin cancer rates. And if you read up on Temporal Lobe Epilepsy , ( and the frequently odd behaviour exhibited by sufferers of this condition ) which is thought to be caused by exposure to the suns radiation, at latitudes relatively close to the equator, you’d probably think twice before you went out in the sun, even in Brisbane, which is a long , long way further from the equator , than Darwin. So, do you think it would be better if Perth didn’t exist? Should we close it down and bring everyone back to the east? It’s far away, but no one is forced to go there! LA is far away from the Eastern Seaboard but New Yorkers don’t have to go there if they don’t want to. You’re right to pull me up on that one! I was mainly being facetious and thinking about how much I’d enjoy flying all the way across the country for work, i.e. not very much! I initially wrote something like, “You are joking, aren’t you?” And of I was trying to ignore the fact that (the least important) 99.9% of us never have to fly from city to city for work. But it leaves your cons a bit thin. Still, it depends on the strength of the cons. And Darwin is… well, I *think* it is a bit more cut off physically than California. Perhaps careful scrutiny of an actual map might make me change my mind, but, deserts and mountains of some sort notwithstanding, California seems to be more a part of a continuum of development than Darwin. But then you could say exactly the same about (cough) Perth AND the whole Eastern clump of the population, taken as a whole. I’ve never been to Darwin, and never spent much time in California either, but is Darwin as “livable” (I hate that word – it should be “habitable”) as, say, LA? I mean with regard to climate. I always imagine it to be “too hot”, whereas California, in my mind, is “about right” for most people. If we could chuck in a globally mesmerizing film industry as part of the deal then we might really have something. Yeah, Darwin’s hot and has a massive rain season. It’s no San Francisco! Miami maybe a better comparison? A previous government tried to establish a ‘northern special economic development zone’ with intent to foster growth and encourage people to move north. I remember it being ripped to shreds in great detail by commentators and those familiar with the climate, distance and particular challenges of living north of the Tropic of Capricorn. It’s interesting that yet another government thinks it’s worth pursuing, with nary a strategy or business case to be seen. I can see Crocs from my chair licking their sharp teeth. Fact is US population in 1900 was triple of today’s Australia. So the ratio LA/NYC and Dar/Mel becomes quite different put against total population. My view is investing a lot in infrastructure hoping for the demand (population / activities) to grow is a risky business. And looking at the evolution of Darwin’s population in the last 50 years, it’s pretty flat compare to say Canberra. So it seems to be quite a gamble. That plsu tropical weather, distance from other major cities make for a difficult case. Unless, unless like California Darwin has its gold rush.